This version of MDK3 has a new feature that sends directed probe requests with invalid SSID characters to an AP. The hope is that if enough probes are sent, the AP will lock up and reboot. MDK3 is a tool that "injects" data into wireless networks. "Injection" is the possibility to send self-made data through the air without being connected or associated to any network or station. MDK3 is used to send valid and invalid packets, which belong to the wireless management and not to regular data connections. This is only possible with this Injection technique. Sadly, this is something, WiFi equipment has NOT been built for in the first place! To enable the injection feature on your wireless card, you possibly need modified drivers. A lot of work has already been done by several hackers (including me) to make these modified drivers available for a lot of hardware. Furthermore, the new wireless subsystem mac80211 in the Linux kernel supports Injection out of the box for many drivers and cards. Using MDK3 is quite simple, since it comes with lots of help screens directly included. Before you can use MDK3, you need to setup your wireless adaptor. As far as there are different driver architectures, the way to setup your adaptor may vary depending on which driver is in use. To make this procedure easy, it is recommended to use airmon-ng from the aircrack project, since it can setup almost every known driver correctly. Read the documentation for airmon-ng to learn how to set your WiFi card into the proper mode. IMPORTANT: You need to set your device to the channel where the target AP/client is, otherwise it won't work! This is a very common error. The good thing of using airodump-ng is, that you don't need to care about setting your card up correctly since airmon-ng and airodump-ng already did this job. Your hardware is now correctly set up, and you can start using MDK3. Another important notice for professional users: Some drivers do not correctly echo back injected frames to the system, thus your injected packets won't be seen if you sniff on the interface on which you are injecting. To check if the frames are sent correctly you need to setup another inteface on the same channel and sniff the injected frames with it! You can also use aireplay-ng's injection test to see if everything is alright. AccessPoints send out approximately 10 beacon frames per second. They are to identify the network. When you scan for networks, your card does in fact look for beacon frames on every available channel. With MDK3, it is possible to send those beacon frames, too. Therefor you are able to create as many networks as you like, always keep in mind, that those networks are fake, and nobody can actually connect to them. People will see those networks when they scan with their WiFi device. Windows does scan automatically as long as it isn't connected and shows an info, if a network is found. Additionally, this mode can be used to hide a network by generating thousands of fake networks with the same name as the original one. This mode has several options to set network name, i encryption, speed etc. When a station connects to an AccessPoint, it needs to fulfill several steps of Authentication. The two basic steps are Authentication and Association. The first step starts the whole process and asks the AP if another station may connect to it, and lets the AP decide if the new client is allowed. A MAC Filter would deny this request if an unknown station would try to connect. In the second step, the encryption is checked. Most APs use the Open mode, so the Association Phase is always accepted, and the real check if a clients key is valid is done later (i.e. in the EAP phase for WPA). The weak point of this is, that you can start multiple requests and forget about them, but the AP needs to keep those request in its memory in order to complete it. This Denial-of-Service-Mode starts as much requests as possible and keeps track of the answers, the AP sends. You can execute this test on multiple APs at once, or you can select the intelligent variant, where mdk3 does itself keep track about clients, and even re-injects valid Data packets it intercepts from the network, so an AP may not be able to distinguish real and fake clients, and may start dropping legitimate ones to free up space. The IEEE standard defines Probe packets. Those packets allow a station to send a request for a certain network into the air, with all matching APs responding to it. 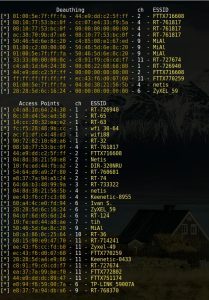 With those packets you can check, if an AP is in your range (ie. if you can reach it and it reaches you). Most APs have a feature called "hidden SSID". With a hidden SSID, a network cannot be "found" with Windows, and will be displayed on other Systems as "Hidden". The beacon frames emitted by those APs do NOT contain the networks name. Instead they either contain ZEROS for each character in the SSID, or only a single Zero. In order to connect to such a hidden network, an attacker must find out the networks real name. As far as the network's name is being transmitted in plaintext upon Association to the AP, an attacker could simply wait until some client connects to the AP or disconnect an already connected one with aireplay-ng or any other Deauthentication tool (mdk3 can do it too, Mode d), and wait for it to reconnect (which it usually does instantly). However, if there is NO CLIENT connected, the SSID stays hidden. With mdk3 however, you are able to try SSIDs from a Wordlist or via Bruteforce. It sends Probe Frames and waits for responses. If you hit the right SSID, the AP will respond to you, and it's name isn't hidden anymore. If you are lucky, the AP keeps the original length of the real SSID in its beacon frames. mdk3 will detect that and will only try SSIDs that match. Deauthentication from AP to client: mdk3 injects a deauthentication packet with the MAC Adress of the AP to the Station, telling the station is has been disconnected for unspecified reasons. Deauthentication from client to AP: mdk3 injects a deauthentication packet from the Station to the AP, telling the AP, the station is leaving the network. Disassociation from AP to client: mdk3 tells the client, it has been kicked because the AP is full. Disassociation from client to AP: mdk3 tells the AP, the client is leaving the network. mdk3 listens on the current channel for Data packets, extracts the addresses of AP and Station from them, and sends one packet of each type. Every second, a status message is displayed, if something has happened. Device is still responding with   500 clients connected! AP 00:00:11:22:33:44 is responding: Your AP is responding to mdk3's fake clients. This just lets you know, that your test is working. AP 00:00:11:22:33:44 has stopped responding and seems to be frozen after 157 clients: Your AP stopped responding to mdk3's requests. Check if your AP is still functional. If not, it is vulnerable to Auth DoS attacks, and needs to be reset if one occurs! You should request a fix from your vendor! AP 00:00:11:22:33:44 is reporting ERRORs and denies connections after 251 clients: Your AP stopped accepting new clients, but did not crash, and correctly denies new ones. Your network is now FULL, but stiull functional. However you cannot connect to this AP anymore until the fake clients from mdk3 time out and the AP accept new ones again. There is nothing wrong with that, this DoS condition is compliant with the IEEE 802.11 standard! Afterwards, you may want to try the intelligent test, that makes it hard for your AP to distinguish fake and real clients. This causes a constant Denial of Service for new clients, as long as the attack is running. And as soon as a legitimate clients disconnects, he cannot re-join the network. In this example, the intelligent attack has been started about 10 minutes after the standard one. As you can see, the AP is STILL denying any new client! So be careful when you test a network that cannot afford some downtime! Waiting for a beacon frame from target to get its SSID length. This time, mdk3 is successful. -b lnus means, start with lowercase, then numbers, then Uppercase and finally symbols. After about 2500 tries, the SSID has been found, and therefor does not add much extra security to your network. Consider using a longer one! mdk3 hops on channel 1, 6 and 11, and disconnects every station found there. Most stations try to reconnect, however, almost no communication is possible anymore, because they mostly get disconnected again, as soon as they re-request their IP-Adresses with DHCP and ARP, which triggers another Deauthentication cycle in mdk3. Use 802.11w if available or some IDS to at least detect such attacks on your network.